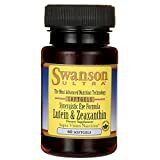 Free-radical damage occurs in your eyes from sun fatigue, eye strain, and lack of nutrients in the diet-Swanson Ultra Lutein and Zeaxanthin can help. The only two carotenoids your body selects for protection in the eyes, they occur naturally in certain colorful fruits, vegetables, flowers and shellfish. One of the most important abilities of zeaxanthin and lutein is filtering out near-to-UV blue sunlight, potentially the most damaging wavelength of visible light, in the retina’s light-sensitive macula cells. Your body can’t make lutein or zeaxanthin itself, leaving diet and supplementation as the only means to acquire these vital vision antioxidants.